“Borrel. Het mooiste woord der Nederlandse taal.” So says Boca’s website, and I’m inclined to agree. 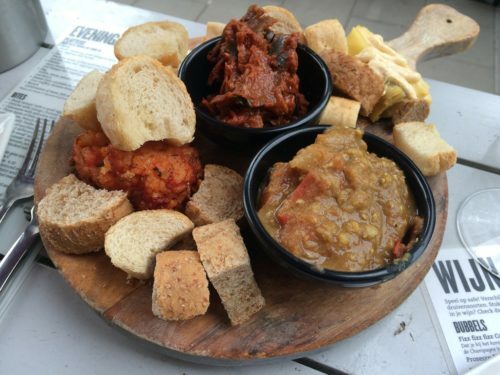 A “borrel”, for those unfamiliar with the term, is a drinking occasion in the early evening (think after-work drinks) often accompanied by various shareable snacks. Boca’s has the borrel down to a fine art. And then some. We turned up at around 7 on a Saturday evening, ordered a few beers and glasses of wine, chose the mixed meat and fish platter (available in small, medium or large), and settled in for a good couple of hours of pre-party preparation. The super-sized wooden board of smoked salmon, prosciutto, manchego with fig compote, rare roast beef with pesto, smoked mackerel, and buckets of bread that appeared cost €30 and was plenty for five. Even with drinks included, the whole lot only set us back €20 each. An absolute Boca bargain, and scrumptious to boot. In fact, the only thing standing in the way of Boca’s being the perfect borrel experience is the fact that spontaneity is impossible. The place is so popular that walk-ins are out of the question, and it took me three attempts to book a table there. Still, if you’re feeling a bit Dutch and want to schedule your borrels in advance, Boca’s is absolutely the place to do it.